It’s November, and we are deep into autumn’s dry and windy days. I just hung our Hoshigaki, and now there are two rows of gorgeous peeled persimmons hanging from strings in my dining room, looking like orange lanterns. I learned how to make these three or four years ago, and already they have become a kind of autumn tradition. I have shown several of my friends how to do this, too. My friend Shirley lets me have persimmons from her tree, a 75-year old beauty that towers over her garage. It has huge leaves, and some of the leaves were already turning red when we picked last week. This year’s crop was not near as heavy as last year’s – perhaps the tree needed a bit of a rest. But the fruit this year, though less of it, seems larger. To make Hoshigaki, which are whole Hachiya persimmons, dried by the Japanese method, one must first choose firm but ripe persimmons. They should be fully orange, but not the least bit soft. When you pick them, leave a little stem – you will need this to tie the persimmon to a string. The persimmons are then peeled, by first peeling the flat top with a paring knife, leaving the stem and calyx intact. Then from the shoulders down, peel with a wide, sharp peeler to the tip of the fruit. 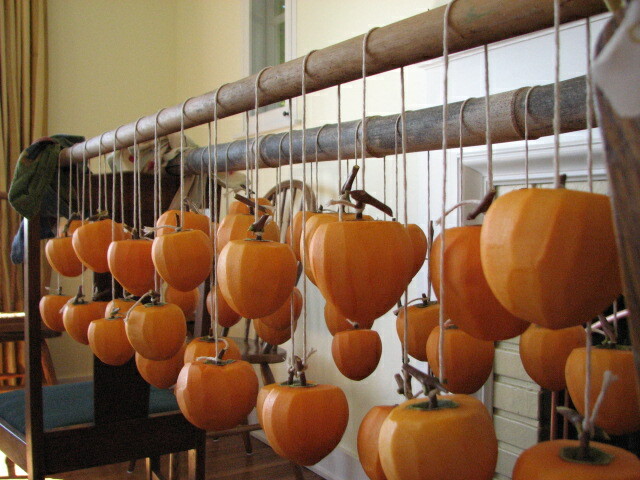 The peeled persimmons are then tied to a string, one at each end, and looped over a bamboo pole. I balance the poles between two chair backs in my dining room, where they will hang for a couple of months. It’s warm and dry in that room this time of year. After a few days the massaging process begins…gently massage each persimmon. This will eventually flatten them into a shape that dries more easily, and the massaging breaks up the persimmon pulp, bringing the sugars to the surface of the fruit. When you massage the persimmons, you need to be careful, because as they ripen they become soft and jelly-like inside. All the how-to details are better found on a website, such as www.instructables.com/id/HoshiGaki/, complete with pictures. You can also order excellent Hoshigaki from http://www.penrynorchardspecialties.com, if you don’t want to make your own. In fact it was Jeff Rieger and Laurence Hauben of Penryn Orchards and Market Forays who taught a class in making Hoshigaki here in Santa Barbara. It’s a simple technique, and a great way to use all those ripe persimmons. I have planted three persimmon trees, a Hachiya for making Hoshigaki, a fuyu, and a maru; the last two aren’t for Hoshigaki, but can be eaten when crisp, and the maru is a lovely chocolate brown color. My trees are young and haven’t fruited yet, but I look forward to someday having our own fruit. Until then, it is wonderful to have a generous friend with a generous tree. Thank you, Shirley.